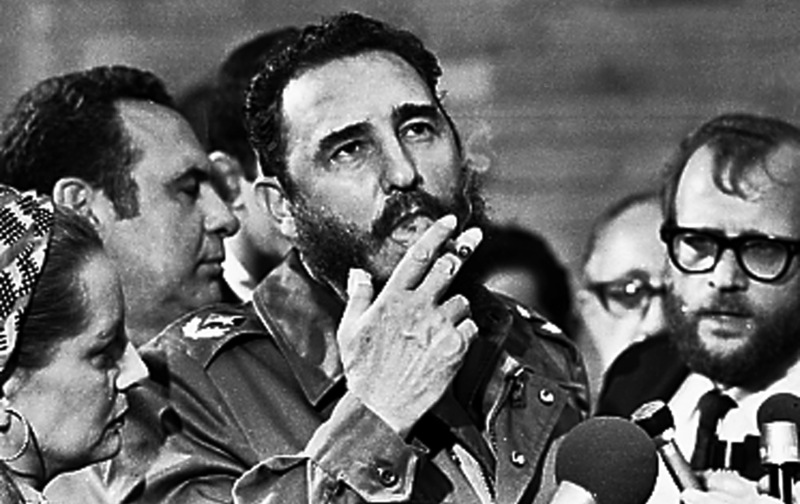 The Cuban revolutionary almost outlasted 11 US presidents. Fidel Castro is dead at 90. He took power in 1959, at the head of the joyful, raucous, and brash Cuban Revolution, which was immediately placed under siege by Washington. Castro almost outlasted 11 US presidents—Eisenhower, Kennedy, LBJ, Nixon, Ford, Carter, Reagan, Bush I, Clinton, Bush II, and passing in the waning days of Obama’s last term. Perhaps he just couldn’t bear the thought of President Donald Trump. Having been sanctimoniously lectured by all 11 US presidents on what constitutes proper democratic procedure, he might have thought Trump, about to take office with a minority of the vote and with significant voter suppression, a vindication. I doubt it. In recent years, since he gave up power to his brother Raúl, Castro has dedicated himself to writing lengthy thought pieces, many of them on global warming, war, the fascism of neoliberalism, poverty, and other threats to humanity. Castro was a famous optimist and an irrepressible strategist, finding ways out of the grimmest situations (such as helping to nurture the coming to power of an electoral left in Latin America, which ended Cuba’s post–Cold War geopolitical isolation). His good friend the late Gabriel García Márquez once said Castro was a “sore loser” who would not rest until he was able to “invert the terms of the situation and convert defeat into a victory.” But, after having dodged by some counts 639 assassination attempts by Washington, Castro is finally at rest. The nightmare of Trump might have been a US president too far. There’s going to be a lot said about him in the coming days, and hopefully the recent thaw between Obama and Raúl Castro will permit a more generous assessment than what otherwise would have been on offer. A good starting place, for those wanting to go beyond the obits, would be the closest thing we have from Castro to an autobiography. About a decade ago, Castro did over a hundred hours of interviews with Ignacio Ramonet, published in English in 2008 as My Life. In it, Castro relates a story that captures his incongruities nicely: One of his earliest political memories, he tells Ramonet, is of the Spanish Civil War. His Galician father was a franquista, as were his Jesuit teachers, who prayed for Spain’s martyred priests. But he also learned of the Civil War, and what was being fought over, from loyalists. When asked by his family’s illiterate cook, a “fire-breathing Republican,” for news of the war, the 9-year-old Castro read him stories that played up loyalist success because he wanted to make him “feel better.” Thus Castro’s very first act of censorship was done in kindness. Another story has Castro, in 1939, writing FDR to practice his English, requesting “a ten dollars green bill.” Roosevelt replied, but didn’t include the ten bucks, giving Castro a joke he’d use throughout his life: If FDR had paid up, then perhaps he wouldn’t have led a nationalist, anti-interventionist revolution. Nationalist resentment is sometimes built from fabricated grievances. Not in Cuba. In the late 19th century, rebels against Spanish rule forged an antiracist and democratic nationalism, only to be preempted by the United States’ 1898 invasion. Over the subsequent years, the United States regularly intervened on the island—the Marines occupied it in 1906–09, 1912, and 1917–22—and just at the moment when FDR proclaimed his Good Neighbor Policy, his ambassador in Havana was openly working to oust a reformist president. Castro incarnated his generation’s finely tuned sense of anticipated betrayal and disappointment, animated by the spirit of New Left volunteerism, in a belief that the course of history could be bent to his will.